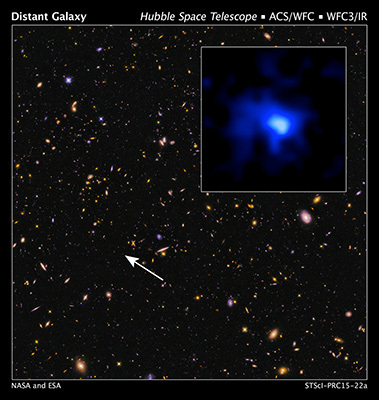 May 5, 2015 – An international team of astronomers, led by Yale University and University of California scientists, has pushed back the cosmic frontier of galaxy exploration to a time when the universe was only 5 percent of its present age of 13.8 billion years. The team discovered an exceptionally luminous galaxy more than 13 billion years in the past and determined its exact distance from Earth using the combined data from NASA’s Hubble and Spitzer space telescopes, and the Keck I 10-meter telescope at the W. M. Keck Observatory in Hawaii. These observations confirmed it to be the most distant galaxy currently measured, setting a new record. The galaxy existed so long ago, it appears to be only 100 million years old. The galaxy, EGS-zs8-1, was originally identified based on its particular colors in images from Hubble and Spitzer and is one of the brightest and most massive objects in the early universe. Only a handful of galaxies currently have accurate distances measured in this very early universe. The discovery was only possible thanks to the relatively new Multi-Object Spectrometer For Infra-Red Exploration (MOSFIRE) instrument on the Keck I telescope, which allows astronomers to efficiently study several galaxies at the same time. Measuring galaxies at these extreme distances and characterizing their properties is a main goal of astronomers over the next decade. The observations see EGS-zs8-1 at a time when the universe was undergoing very important changes: the hydrogen between galaxies was transitioning from an opaque to a transparent state. “It appears that the young stars in the early galaxies like EGS-zs8-1 were the main drivers for this transition, called reionization,” said study co-author, Rychard Bouwens of the Leiden Observatory, Leiden, Netherlands. The new observations underline the very exciting discoveries that NASA’s James Webb Space Telescope will enable when it is launched in 2018. In addition to pushing the cosmic frontier to even earlier cosmic times, the Webb telescope will be able to dissect the infrared galaxy light of EGS-zs8-1 seen with the Spitzer Space Telescope and will provide astronomers with much more detailed insights into its gas properties.